Advocates and lawmakers have been warning about the risks of liquid nicotine to children in increasingly popular e-cigarettes, and worst fears were confirmed when a 1-year-old child died last year after ingesting the toxic product. Often sold in flavors attractive to kids like bubblegum and cotton candy, just one teaspoon of concentrated liquid nicotine can be a deadly dose for children. Meanwhile, e-cigarette use among older children and teenagers is skyrocketing. Despite the dangers, federal regulation has not kept up with the rapidly growing and evolving e-cigarette and liquid nicotine marketplace. Proposed regulations fall short of fully protecting children, and instead the lack of oversight has led to a proliferation of liquid nicotine retailers targeting young Americans. Symptomatic of the problem, liquid nicotine is being sold across the country as exact copies of, if not confusingly similar to, brands owned by widely recognized and trusted, companies. 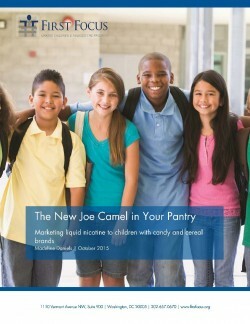 In this report, First Focus uncovered over 500 cases of liquid nicotine being sold in flavors of candy and cereals adopting favorite brands such as Wrigley’s Big Red gum and Quaker Oats’ Cap’n Crunch. Access the database of cases here.